Welcome to MasterClass Training & Consulting LLP. Next Level of Success . Simplified . Core purpose & mission of MasterClassTM is to contribute, in our own way, to the economic development of our country by helping Indian organizations and individuals reach the next level of success, by providing simplified training programs, tools, & consulting services, through various mediums across the country, through professionals with practical industry experience. MasterClass has helped more than 1,000 companies and individuals from Mumbai, Chennai and Hyderabad, in developing their Strategy, Planning and Implementation Process to grow these companies to the Next Level of Success in a Simplified manner. In Sept 2012, MasterClass was invited by a German BioScience based pharmaceutical company BSV BIOSCIENCE GmbH to help their core team develop its Strategic plan and Execution plan at Germany. Our clients range from various sectors and industries. They are from manufacturing, services, IT hardware & software, eCommerce, retailing, consumer goods, pharmaceutical, chemicals, plastics, textile, garments, fashion & lifestyle, real estate, jewellery, sports & fitness, hospitality, stainless steel kitchenware, electric switches & accessories, financial services and education sectors. For learning How You Can Take Your Company To The Next Level, and to read Hundreds Of Transformational Experiences Shared By Our Clients, click the link below. "Transformational Experiences Shared By Our Clients"
"As a CEO of the Company, I have a feeling, comparable with the feeling of having received new spectacles, giving me a much clearer view than before. To drive a car is not a difficult job, but to find the way to the desired destination is sometimes tough. Now, we have a GPS System, which not only guides us, it is even reminding us, in case we lose our track." MasterClass teaches only one thing, "Recipe for success". Masterclass made us realize that everyone has the capability to become the next Kishore Biyani or V Siddhartha of Cafe Coffee Day.. Each and every session was an eye-opener. At the end of every session, I asked myself, OMG! It?s so simple. Why didn?t I realize this earlier? In such a gloomy scenario, Ambrish Sir has made us believe that ?Anything is possible if you have the right strategy. There are no jargons and big marketing plans. It?s made simple in laymen?s language. Yet, it?s very powerful. Alas, if these strategies are taught in management schools, our nation would be o top. Move on, Philip Kotler, Peter Drucker and Stephen Covey. We have our own indigenous genius called Mr. Ambrish Chheda. When Top 500 Companies will be listed in 2020, there will be FORTUNE (Nate) MasterClass 500, and the unfortunate rest!! MasterClass must position itself as ?Strategy Execution.? What I liked most about this course was, its sequencing, clarity of thought, graded approach, excellent examples and FUN along the way!! “MasterClassTM has helped us take our journey from ‘Good to Great’, from the ‘Ordinary’ to the ‘Extraordinary’. The commitment for others’ success they show is something to be experienced. MasterClassTM has truly developed simplified strategy tools to take one’s business further. When you experience the tools, start to use them for your day to day business operations, one truly realizes the potential power you have been equipped with, myself having been in various business verticals for the last 25 years, have started using them from day one. Mr. Ambrish Chheda has definitely arrived in the space of a Thought Leader on Simplified Strategy & Execution." ?I really learnt to believe in big dreams. It gave me a lot of new ways to think about me, my work & the whole life?. search what we have to do next. It has come into our heart & soul. Thanks a Lot MasterClassTM. ?Joining the MasterClassTM workshop has turned out to be a boon for me and my company. It has given me a clear vision and laser sharp focus & action plan for the next 10 years. Mr. Ambrish Chheda is the most energetic and excellent task master! The most effective and unique feature of the course is the exhaustive telephone discussions improvising worksheets?. “It was a very enriching experience for me. The kind of exercises we had done was really very amazing because now I have understood the depth of strategy planning process. One thing I want to compliment is the time & effort which Mr. Chheda puts in the mentoring sessions that is really OUTSTANDING”! This course has helped me bring a street smart super achievers mindset and by bringing in the awareness, the beginning is made! Now, setting clear goals, processes in place, a target of Rs. 200 crores in 5 years seems most believable!! This strategy Course is easy to grasp and is much beyond what can be understood from the best books written on the subject. The personalized telephone sessions, case studies drawn from participants and Mr. chheda going the extra mile is what makes it most unique. ?One simple word for Mr. Ambrish Chheda & his MasterClassTM Program: Difference Maker?. ?This MasterClassTM workshop was very exciting for me. Was well structured. Mr. Ambrish Chheda chose various examples to explain the concepts. Learned some very interesting things not only for business but for life. Got useful information on Marketing Strategies for low cost brand building. It got absolutely clear that company?s success not only relies on finances but also in strategies, marketing & team work. Workshop was presented with lot of emotions-some key facts were implanted directly in my mind because of this?. “MasterClassTM has given me absolute clarity, laser sharp focus, a burning desire and a simplified methodology to take our business to the Real Next Level. Mr. Ambrish Chheda is a master trainer with tremendous knowledge of various businesses and years of experience the field of business management”. “I am a self made Entrepreneur. I did not have a Mentor, or background or a direction. There was confusion, no clarity. With MasterClassTM, our mission statement, vision statement, and values are now defined in a simple manner. The structure of my company is now systematic and organized. I have learned a lot from this workshop and it has made my life simpler. We are recharged, have increased speed tremendously”. Manufacturers of Safest, innovative & cost effective pharma packaging solutions. MasterClassTM showed us how to convert our business dreams in to reality. It helped organize our thought towards next level of growth. What I like best about MasterClassTM is its uniqueness, eye-opener for our business possibilities and out of box thinking. ?Simplified and targeted delivery with focus on your business is what makes this workshop unique. It?s a transformational process which all businessmen must go through to streamline their plans, put them on paper and prioritize them. The best thing about MasterClassTM is its focus on execution and telephonic one-on-one sessions?. ?With more than 25 years of experience under his belt as senior management in top companies, Mr. Ambrish Chheda has simplified strategy used by fortune 500 companies to help your business grow to its fullest potential. Trust me; joining this workshop is the best investment you will ever make in your business! Attending this fabulous course on business strategy has given so much shape and direction to my business. This is a training class like no other, where the trainer in addition to classroom training mentors you one-on-one to take your business to the next level. So, if you are wondering how to make your business even more successful, Ambrish Chheda is the man! He has the dedication, commitment and genuine intention to help businesses grow with an extremely well organized, no nonsense, realistic yet inspiring approach which is unique to your business.? Manufacturers of natural & herbal medicinal Products for managing lifestyle diseases, pain management. Valeria Oil, Rhodendron juice and Hair oil. “We used to do everything in a small scale. Now we will think bigger”. “Brilliant! I have been attending strategy & management programs for 21 years. Thought I knew everything on Management, until I attended the program. I realized that there was a lot more. MasterClassTM has really broken down complex subject like corporate strategy in to simple steps”. “Just 8 Sessions of MasterClassTM have given us a business plan for next 8 years! Before joining MasterClassTM , I did not have a mission or vision for my Company, only Values. My DNA was ‘conservative’. MasterClassTM has taught me to change my DNA to ‘Realistic’. We now have a GPRS system connected to a satellite called ‘MasterClass’, guiding us; we can easily cruise at a speed of 100 km/hour without asking for direction, on the right path! I am grateful to MasterClassTM for bringing this change in me”. “Mentor Ambrish Chheda is an absolute master in the ‘Strategy Simplified’ and he lives by it and it is fully reflected in his passion to teach and coach in MasterClassTM. The core of promise of simplified strategy is delivered to the fullest, in a simple and effective manner. And the result of this is the actions which I take now in my organization. MasterClassTM is the ‘ONLY’ institute for Corporates and SME organizations to achieve growth and the NEXT LEVEL”. “What I like the most about MasterClassTM is the transformation in the thinking process for taking the company to the next level. Excellent experience for doing the self evaluation and come back refreshed with new ideas for taking the company to the next level”. MasterClassTM Workshop has helped us to clarify our mission, values, vision, and has helped giving us a direction for our future growth. I am very excited now that we have a 4-Page Strategy & Execution plan, all our worries, obstacles have been removed. Strategy and Execution Review Meetings with core team will be very clear and simple, subjects will be divided, no wastage of time, everything will be self answered. The workshop is highly motivational and inspirational. It is conducted with personal attention for each participant. We are lucky to have a person like Mr. Ambrish Chheda amongst us. After every session of filling the worksheets when all 5 of us from our team used to go home, we used to say “Mazaa Aa Gaya!” We are planning to have all our senior employees attend this course, starting with their next workshop. “I am from the stainless steel utensils manufacturing business which is an unorganized sector. We have not been able to corporatize our company for so many years. Doing the 8 sessions of MasterClassTM workshop, has been like putting an eye-drop that has removed the haziness from the eyes. Suddenly everything is very clear now. I have learnt the importance of DNA at MasterClassTM. This course is designed after a great journey of experiences by Mr. Ambrish Chheda. It’s like extracting butter after churning the butter milk of years of experience! That’s what MasterClassTM gives you”. “Really simple but focused. Made me revisit the whole business, to enable me to remove traditional blockages and made me think differently to move to REAL NEXT LEVEL. A new beginning, truthfully”. 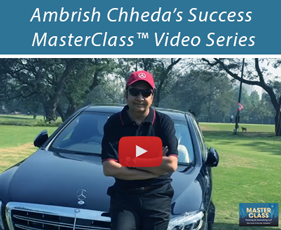 “The Master of MasterClassTM Mr. Ambrish Chheda has given us a Master Key to take our business to the Next Level with laser sharp focus with a simplified methodology”. “MasterClassTM will make a difference in your life. You will think differently and you will definitely want to do something bigger and better. Mr. Ambrish Chheda will make this happen. Not only is he a great speaker and delivers a great deal of enthusiasm in his presentations, but he sincerely, from his heart, wants you to excel. I would like to thank him for opening my eyes and my mind to new opportunities. What I like about MasterClassTM is the impact it has made to my life”. “A teacher teaches you, but MasterClassTM guides you. Today’s youth in India has a lot of energy, but don’t have the right kind of guide. MasterClassTM has allowed me to focus and channelize my energy. We are indebted to MasterClass for life; a shishya (student) can never repay the debt to his guru. The worksheets by MasterClassTM have provided us a simple path to the next level. If clarifying the mission, values & vision for our company was the first eureka moment, zeroing down on 8 Long Term Goals out of 17, was the second eureka moment, the second milestone in this MasterClassTM Workshop. Key takeaway for me from the workshop is ‘Laser-Sharp Focus Plan’ for my business & my life. Thanks MasterClassTM." "I rename MasterClassTM as ‘MasterJewellers’, as they convert raw diamonds (businessmen), to high quality finished Diamond (all round Entrepreneur). • Clarity: Creates an absolute ‘CLARITY’ of thoughts by simplicity of the content. • Cut: Shows us a path and technique which can ‘CUT’ through the normal cash creation activity to a wealth creation activity. • Shine: Following the course and its method would definitely make our Company standout and ‘Shine’ in the Industry. • Fire: It has for sure created ‘FIRE’ in our bellies to take the company to the next level of Success. • Carat: Though simple, the course and its contents have 100% ‘CARAT’ content of high grade Management Lessons." “MasterClassTM has simplified my thinking. I have understood the importance of various topics covered in the workshop. Most importantly now, I have understood the importance of differentiation and innovation. The milestone calendar and regular strategic review of execution plan will change my working”. “The Master at MasterClassTM and his dynamic presentations have infused in us a new lease of life and a system to run our organization professionally and make our journey to the Next Level very simple. It was a totally enriching experience which has widened my scope of thinking and also helped me get a completely different view of managing my business and career. I thoroughly recommend this to one and all to join & experience this life changing experience”. “A truly motivational and inspirational experience that helped me redefine a very clear mission for my company. The simplicity with which a very complex process of creating a corporate strategy was explained was amazing”. “Mr. 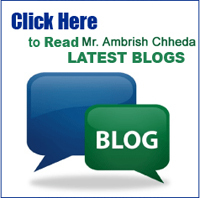 Ambrish Chheda as a mentor is a great guide. His ability to guide everybody irrespective of their different fields is amazing. Worksheets were critical, these made it easier to convert our thoughts, ideas, and goals, into an easy strategic plan which can be referred any time. Mr. Chheda’s example oriented presentation made the workshop easier to understand and adapt”. “Before attending the workshop we were achieving the objectives but not in a planned manner. 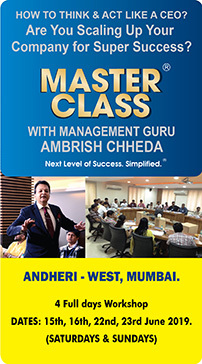 After attending the strategy simplified MasterClassTM with Ambrish Chheda, we understand the value of mission, vision, core values, and simplified strategies to travel through the next level of success”. “Made me more focused & positive. This will definitely improve the working of our organization”. “It was an extraordinary experience with Mr. Ambrish Chheda. It was totally personalized training that continued even after the training sessions were over. MasterClassTM worked hard for each participant so that they can achieve the Real Next Level. What I liked the most abouttheir simplified strategy methodology was the defining and writing down the core purpose of existence of our firm, its vision, values and DNA”. “StrategySimplified methodology of MasterClassTM is a great method that helps organizations to think in different lines which helps them to create their own simplified strategic plan. With Mr. Ambrish Chheda I have learned a new way of thinking which will benefit me and my business. Thank You Sir”. “This is a MasterClass! Loved every aspect of the workshop, Lots of experience gained, Interaction is tremendous. Great class, great topics and an awesome power and energy to drive home the points by Mr. Chheda - as they say "Dimaag Ki Batti Jala De!" “Before I joined MasterClassTM, I faced a lot of problems, stuck in my daily routine. MasterClassTM has been an eye-opener, we learnt to do things in team work, this will help me guide my staff, and focus to work in a simple and systematic manner”. “Very helpful in streamlining focus, strategies, mission etc. Must do course for all management staff and entrepreneurs. MasterClassTM has helped me realize the scope which is much wider than exists in just our own industry. It has helped us focus on one thing rather than too many things at one time. Many of our employees did not understand our mission & vision. We are now deputing my other partner and senior members of our team to join the next batch of MasterClassTM so that we are on the same wavelength while jointly developing strategy & implementing it”. “Before MasterClassTM we were wondering how to go forward. Now we feel the world is our platform. There are so many horizons to be broadened”. “MasterClassTM has opened up a whole new dimension for me and my company. It has helped me build my company’s future by planning and adapting to differentiated yet realistic & practical strategies. The exercises that we do make it so simple and easy to visualize and plan. I deeply appreciate and thank them for their efforts, support and valuable time given to us”. “What I liked most about this course is that, it made it easy and simple to understand a complicated subject like corporate strategy. I would like to join all the Workshops which are going to be organized by MasterClassTM”. “Mind boggling mentorship. Thank you very much MasterClassTM for the great course content which will show us the easiest route to the highest level we are thinking of”. “The Road was foggy, therefore we were walking slow. After doing MasterClassTM StrategySimplifiedTM course, the path suddenly appears very clear. Now we can run”. "After the two days of StrategySimplifiedTM MasterClassTM, I feel on top of the world. We have done many courses before but we don’t plan & don’t apply since nothing is clear. At MasterClassTM we have learnt to review every 15 days”. This course was an eye-opener and extremely inspiring. It cleared our vision and path to our vision which was not clear before the workshop. We want to create a legacy brand but we didn’t know exactly how to do that. MasterClassTM has provided us the mentorship, guidance and tools to be able to create an effective path for the journey. Thanks to MasterClassTM. I wish them good luck for the future, keep up the phenomenal work! “I firmly believe that MasterClassTM is an ideal platform to structure the whole business in a more systematic & organized way. The teaching has helped me to sharpen & fine tune our strategy with a simplified methodology to take our business to the real next level”. “It helps in opening mindset in a simplified way for future growth, I can think positively for the next level”. “I am very happy that the mind blocks I had before this MasterClassTM, have disappeared. I am indebted to MasterClassTM for the vision they have given me for my stores & for online store”. “I feel lucky to be part of MasterClassTM. It has removed clutter from the mind. We used to think that we need a big strategy to move forward. I now see it as so easy & simplified that when we fill up these 33 worksheets, I am sure we will have a clear strategic plan for the next 5 years”. “Cleared my mind of all misconceptions, fears & difficulties in moving to the next level. I feel more focused and thought process has become more streamlined and systematic. We learnt that we had values but no mission & vision and that our implementation could be better. Now everything is clear”. “The method of explaining was very easy. Before I came to MasterClassTM, I was very confused. Now, strategy & future planning is very clear”. “Many of these concepts were taught in college but MasterClassTM taught these in a most simplified way. I will use these for success”. “It provides a good direction for people to grow their business as you can have great clarity of thought”. “MasterClassTM has helped me come out of negative thoughts. Now I have a mission & vision to prove to ourselves what we are capable of. Now I have an aim to take our business to the next level & be more successful”. Designing, manufacturing and installation of Tensile Architectural Structures for breathtaking roofing solutions. Real paradigm shift happened when the real ‘mission’ evolved after one-on-one discussions. Rest of the process of simplified Strategy & Execution, is a cakewalk. Thanks to a well developed worksheet format. Natural farm nutrients for higher yield & quality of farm produce. MasterClassTM offered simple solutions to complex problems, made me understand my business better, motivated me to pursue my goals and also energized me to achieve them. This course has changed my thought process and Mr. Ambrish Chheda has simplified our business model and given me great clarity of thought. Overall, it’s been an enriching experience and time very well spent. We shall definitely reach the next level. Marine survey, geotechnical investigation and geosciences mainly for oil & gas industry. Excellent information, presentation, perfect course structure, very conducive and effective environment. Received very concise and summarized information about foundations, planning and executing business strategies. Simplified way of learning business management. This has really transformed my thinking about doing business. I was all my life making money by selling goods or products, but never knew how to really make it professional. It has happened here! Mr. Yogesh Sidana, Manager- Metal Trade Inc.
International supplier of ferrous and non-ferrous metal scrap, copper ingots & billets, copper ore across the world with scrap yards in 3 countries. MasterClassTM is just amazing in making complicated subject of business strategy simpler. MasterClassTM is real mentor and guide no matter what your industry is. Mr. Ambrish Chheda is like guru Dronacharya of Mahabharat who not only taught Arjun the techniques but prepared him for the best and also taught him how to go against the flow. The way the concepts were cleared with simple language was really appreciable. Finer details of business strategy are explained from the grass root level. It is just like a pair of spectacles which helps a person with an unclear vision, see clearly. The steps to convert a vision into reality with the help of worksheet exercises and individual counseling is highly commendable and realistic in approach. It puts you and your business in the right direction and reach the next level. This course is so simplified that every person can learn a lot. Mission, values, vision become clear for the future. It was helpful in every way, marketing, manufacturing, selling and planning new initiatives to take the company to the next level. One of the largest & most modern infrastructure for Hazardous Chemicals warehousing & Storage. The workshop included all the points which are required to grow an organization. We got tremendous clarity and push towards our way to success. Now we are quite clear where to take my company in the next few years. Ms. Tarla Jagani, Proprietor- Jolly Arts. Mehndi Design Classes. From MasterClassTM I learnt how to grow my business, by developing a chain of centers. I also learnt how to identify customer pain points & how to train our students. What I also liked is filling up simplified worksheets & MasterClass’s unbelievable telephonic support sessions for improvising those sheets. MasterClassTM Tmhas shown me the way to grow my business. It has been the most transformational experience of my life. ?This MasterClassTM workshop has helped me to: think big, how to achieve goals, how to organize thought process with clear and focused thinking to reach the next level?. Mr. Jitendra Savla, Owner- Rutu Gruha Udyog Manufacturers of dry rotla’s and Indian snacks. I got lot of lessons about my own business. The knowledge & experiences shared by MasterClassTM are invaluable. ?We pray to god every now & then and ask him to give us success. 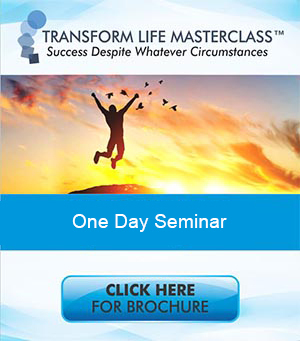 Instead, those who really want to go ahead in life must join the MasterClassTM workshop. MasterClassTM has helped put my plans for success on paper which I can refer to anytime. It has raised my confidence level so I can reach my goals in a simplified manner. Teaching techniques of Mr. Chheda are Superb?! ?The Sky is unlimited, but if you want to fly unlimited, join MasterClassTM Strategy Simplified Workshop! It is a creative and simple course, it has helped me redefine myself?. ?We were not clear with our goals in the past, after this course, I know where to focus and execute in a simple manner. Mr. Chheda explains everything in detail and interaction with him over telephone during worksheet improvisation is excellent?. ?MasterClassTM & Mr. Ambrish Chheda ?Walk the Talk?! Mentorship received during the Workshop has given me belief in my chosen path. It is due to MasterClassTM I would now be able to visualize a bigger canvas and dream with my eyes wide open?. ?It is a simple course to bring out your strengths and ability to efficiently go to the next level with minimum risk for maximum success in an organized way?. ?MasterClassTM Strategy Simplified Workshop was a wonderful experience whereby, the real potential of our business evolved by making a fantastic roadmap for the future, by ensuring all the SWOT?s were taken care of. Strategy and Execution plan was put on a 4 sheet paper for the next 5-8 years?. ?Segmentation and Strategy is very clear now to help us go to the next level? Thank you MasterClassTM"! ?Cleared my mind to move to the next level. Simplified way to reach our goal successfully. MasterClassTM teaches us to work in a proper direction in a systematic manner?. ?After crossing few hundred kilometers in the lakh square kilometers of the packaging industry of India, I was struggling to know where and how to move from here. MasterClassTM helped me ride a submarine and showed me ways how to travel thousands of kilometers of Deep Ocean with safety. Passion and conviction of Mr. Chheda to guide delegates with adequate examples and tools. Thank you with tremendous respect and love from the heart?. “Very interesting. We can reach our goals for 2020 Successfully”. ?The discussions during the workshop helped open up certain things to upgrade my company. The telephonic improvisation sessions were very good?. ?This Workshop has given me the right direction to achieve my goal. It has made me realize my potential and the potential of my business and the plan to achieve it. I could never imagine that I could reach such levels. MasterClassTM Rocks!!!? ?MasterClassTM is a ?Pathshala? where multiple entrepreneurs discover aspects of their businesses at the same time from common simplified teachings beautifully delivered by Mr. Ambrish Chheda. The telephonic improvisations are very good?. 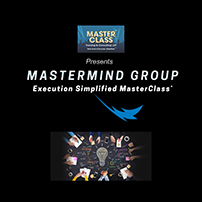 ?MasterClassTM Strategy Simplified is a focused, to the point and very clear Workshop. It has given us a simplified and crystal clear road map to fulfill our vision and has greatly boosted our confidence in achieving the dreams of our Company?. ?This is just not a course; it?s a transformation of your company to go to the next level by simplified planning and execution. Mr. Ambrish Chheda takes personal interest to see that you set goal and vision for your company. He is a great mentor to lead you and your company to the next level. Thank you MasterClassTM from the bottom of my heart. A must do course for any company which wants to reach the next level ?. ?MasterClassTM has made life simplified. Teaching modules are extremely simple. Please create more awareness of this Workshop to benefit SME?s like us?. ?MasterClassTM has played an important role in simplifying the growth direction of our company, by providing a complete strategic & execution plan, with reasons & facts, responsibilities & target dates. Before MasterClassTM I knew ?what can be done? and now I know ?what I can do? and I will do it!!!? ?MasterClassTM has cleared the fog/smoke from our path. Rather than inventing new, it was the discovery of our organization?s true potential and tapping it. It is the road map to success. SIMPLIFIED?. ?Joining MasterClass is a turning point of my life. Ours is a small scale, start-up business, MasterClassTM has given so much guidance and support. We can now optimize ourselves and grow as brand. I will make MasterClass proud of me!? ?We are a Catering business, now we know where to go and how to reach the next level. With the guidance of MasterClassTM, we can improve ourselves and expand. ?We changed the name of our company from ?Ashapura Gruh Udyog? to ?Sagar Caterers? as suggested by MasterClassTM, and promoted our business as guided by them. Within 2 weeks we reached a stage that we were booked with orders for all the days of weeks. MasterClassTM has rewritten our destiny & we don?t know how to thank them for this, as no words will suffice.? ?Before doing this workshop our thinking was only ?survival?, now MasterClassTM has given us new vision to go to the next level of success. Everyone must do this course to expand their business. This is an amazing course. Mr. Chheda is an extraordinary mentor with great knowledge.? ?Before MasterClass, Strategy = Complex; After MasterClass: Strategy = Simple Steps to achieve your Dreams! It is a systematic approach to each point, summarized into a practical doable plan in the end. Personalized telecommunication was very unique and useful. In the end what the mind conceives and believes it can achieve. Mind is capable to conceive, but to believe in it, join MasterClassTM!!? ?MasterClassTM is THE MasterClass! It is simple and effective. Everyone should attend & implement these simple planning ideas to achieve the goal?. “MasterClassTM teaches to drive our business in the right direction smoothly. It?s a wonder that Mr. Ambrish Chheda can handle every Company?s case individually like he knows everything about that business! The Workshop helped me decide a goal for my business. Mission, Vision and Values are clearly defined now?. ?We got inspiration from MasterClassTM and now know to what level we can take our business. And we now know which path we must take to reach that next level?. ?I lost all fears because of strategic plan developed at MasterClassTM aur mere dil ke darvaje khul gaye. We have found a new direction & new path for our company as MasterClass helped us develop our Mission, Values, Vision and a detailed execution plan for 1 year. Once again, we salute MasterClassTM?. ?What I liked most about MasterClassTM is the simple teaching methods, and how by filing worksheets we could create a simple yet very good plan for our business, and the knowledge we gained about what we must do to take our business to greater heights. It has given a new direction to our business. Truly, MasterClassTM: ?Dimag ki Batti Jala De?. ?I liked the simple methods to plan & implement our goals learnt at MasterClassTM. Many fundamentals of business that I have learnt will no doubt take my business to fantastic heights?. ?By joining this course, we got a new methodology to run our business by clearing doubts and obstacles to go to the next level very easily.? ?Everyone says ?Take it easy? but MasterClassTM says ?How to make it easy?. MasterClassTM is doing excellent work in simplifying action plan and strategy.? ?A New Chapter begins now. We have clearly understood our reason for existence and our mission. We now have clarity on ?Being Customer Centric? and that we exist because of customers and not the other way round. Our action plan is ready and waiting to be implemented, so that we can go to the next level. The best thing about Strategy Simplified Workshop is Mr. Chheda?s understanding of our business and guidance he gives during the telephonic sessions and the workshop?. Urvashi Makharia, Partner, Kyo?rai, Fashion research and customized hand embroidery catering to leading fashion houses internationally and a fashion boutique. ?This was an eye opener workshop. It has given me a thought process first to understand my own destination & then the process to reach the destination. Until now, I was doing business or work as part of family business. MasterClassTM has given us a beautiful gift called ?mission? and how to accomplish it realistically.? Alok Makharia, Partner, Shy Kam Exim LLP, A 70 years old cotton trading, import and export house. ?MasterClassTM has gone the length to devise an in-depth strategic program that is ?guaranteed? to help any business that wants to grow exponentially. This workshop will ensure that an entrepreneur will find the focus along with the requisite tools for the lifetime of his/her business. Truly, this is a must do experience to find the next level of success. The worksheets and one-on-one telephonic sessions are very helpful. ? ?MasterClassTM has changed our thoughts and ideas about how to improve our organization in a simplified yet excellent way. Any organization big or small must do this workshop.? ?MasterClassTM workshop has helped us a lot in finding direction and creating action plan in a simplified manner. People who want to grow personally and in their business must follow MasterClassTM strategic plan methodology. You can break the boundaries of limited thoughts and create miracles. You can reach the sky!? Very clear focus on mission, vision & action planning with simple system. I have no doubt that MasterClassTM will help take our business to the real next level like an engine pulling a train. We had absolutely no mission & vision and did not know how to scale up our business after reaching the top in our bindi manufacturing industry. MasterClassTM has made the path very clear and kept it simple. Even a business man with little education can understand the process taught by MasterClassTM. With their worksheets, we can write down our strategic thoughts and then how to convert them in to reality through implementation plan. This is a must do workshop for those who want to go to the next level. I have understood Team Work power and how to harness it, with proper clarity, vision, mission and values. I was unable to think so far, now, we have learnt to think seven years ahead while making 20-20 vision. The execution plan, five year goals divided into yearly laser sharp goals for one year made it very simple and do-able. I am clear with strategy and execution plan for the next seven years. I feel blessed to have done this course. ?Next Level Simplified? Yes! It is really! Will take my company to the next level in a simplified way. Things were looking difficult earlier, after this course; I received a direction and plan, in a simplified way to take our organization to the next level. Before MasterClass I used to underestimate our Company?s potential. I understood the power of mission, vision and values at MasterClass. Now I know for sure that we will achieve our vision and in due course, our mission as well. Thank you MasterClass for providing all the tools necessary to achieve our mission. At a personal level, this course has changed my outlook towards myself; I have become positive and confident. This course has helped a lot to transform the mind set of our organization. I have come to realize the value of mission and vision only after doing this course. Even in my personal life I never had a mission or mission. Today, we have a clear mission and vision personally and for Team Enviro. 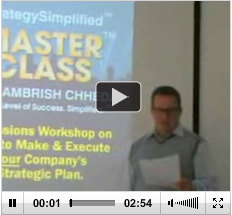 MasterClass Strategy Simplified Workshop is excellent and I would definitely recommend to other to join this course. Every person should join MasterClass, to achieve goal of their company and personal life. This course is very good to take your business to the next level. Clear-cut Mission makes your approach to your aim easy. ?This Course has opened up so many perspectives. It has given a direction and Goal to take our company to the next level?. Minesh Shah, Owner, Ami Clothing Company, Manufacturers and retailers of Girls ethnic wear. Before Joining MasterClass, I had always thought of progress. But never had clarity of thought, now I am very clear about my mission/vision and the road map to achieve it. It has helped me clear all the cob webs from my mind. Dharmendra Shah, Partner, Ami Clothing Company, Manufacturers and retailers of Girls ethnic wear. After doing MasterClass you can go out on your business platform and hit four?s and sixes to achieve your goal. MasterClass teaches you to Work in a proper, systematic and simplified manner. It is a beginning of a second inning?s of my company to take it to the next level of success. Deepan Shah, Partner, Ami Clothing Company, Manufacturers and retailers of Girls ethnic wear. MasterClass has opened my mind, now I have clarity of thought and helped me remove negativity. It has shown the path to implement our plans in a simple, organized manner. It has reinforced the belief in myself that I can achieve more than what I dreamed of. Paresh Gogri, Owner, Kalpana Apparels, Retailers of readymade garments. MasterClass was a very good experience, vision, and roadmap is clearer. If anyone wants to grow their business, they should take this course. It is truly MasterClass! Mr. Chheda gives powerful explanations with simple examples. Navin Shah, Owner, Sagar, Retailers of readymade garments. Masterclass truly rocks! Before coming to Masterclass, we were clueless about our goals, but now our goals are 100% clear. Our Strategy is now clear regarding every aspect of business, especially, staff, ambience of my store and brand building. Vadilal Dedhia, Owner, ITS Creation, Manufacturer?s of Ready Made Garments. After attending MasterClass, I have proper guidance to focus my strength?s into brand building, customer care, and market research. Now, I have an aim to grow my business and goodwill to achieve my ambitions. Thank you MasterClass. This course gave me an insight and fresh perspectives into my own business, professionally! It simplifies complexities, its tangible, deliverable and trainer gives in depth attention. Personally introduced me to 4 lines that will be with me for the rest of my life. I?m the Captain of my soul.? After doing this course, there is a complete transformation of mindset and substantial value addition to the existing competencies. It has simplified complicated business jargons and theories into executable format. Now there is a clear change in how I see, think, plan, strategize and reach towards my goal. I feel after I align my team to the same vision, mission, values, goals, my organization can progress substantially. With our Founders vision, we were functioning and progressing. Masterclass helped us broaden our Vision and aspire more and taught us the importance of DNA in business. The course has a Holistic Approach. MasterClass helped us develop a 4 pages Strategy and Execution Model which can be used to achieve our mission and goals. Kunal Gala, Director, JNK Lifters, provides construction equipments on rental basis to construction companies, piling & foundation specialists, contractors, petrochemical, and oil and gas industry, infrastructure projects. MasterClass is ?Perfection Ko Perfect karna Bohot Mushkil hota hai Sir?!! It has changed my company?s vision, transformed my thinking, made me aware of my potential and showed me the path to the next level. MasterClass content is Excellent! It has opened up the mind towards thinking on the lines of scaling up, by clarifying the basics. The emphasis on being ambitious is highly appreciable. Over the last one month, I have undergone a transformation in how we have been doing business. I leant that, unless a road map is made, there is no way our dreams can be realized. Mr. Chheda with his wide experience helps you create that road map with complete hand holding. What I have attended can be called ?THE MASTERCLASS!!? Mr. Frank Scheid, CEO, BSV BioScience GmbH, Germany. Watch HOW MasterClass Client OPTILINK Achieved 100% Growth Despite Tough Competition OP HARSHWAL, CEO, V-XPRESS - TESTIMONIAL FOR MASTERCLASS STRATEGIC EXECUTION CONSULTING METHODOLOGY.